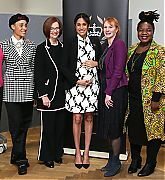 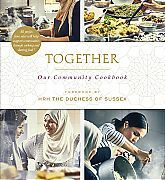 On International Womens Day March 08, 2019 The Duchess of Sussex, Vice-President of The Queen’s Commonwealth Trust joined a special panel of female thought-leaders and activists to discuss a range of issues affecting women today. 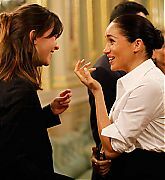 Hosted by Kings College London, the event brought together Annie Lennox OBE, founder of The Circle, an organisation supporting and empowering women’s lives around the world; Adwoa Aboah, founder of Gurls Talk, an open community where young girls can talk about the issues that matter to them; Julia Gillard, Former Prime Minister of Australia and Chair of the Global Institute for Women’s Leadership at King’s College London. 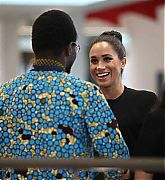 Also on the panel was Chrisann Jarrett, Founder of Let us Learn; and Angeline Murimirwa, Executive Director of the Campaign for Female Education (CAMFED) in Africa and co-founder of CAMA, a pan-African network of young female leaders and Anne McElvoy, Senior Editor of The Economist was chair. 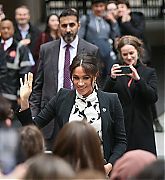 In front of In front of an audience of students, opinion formers and young leaders The Duchess spoke at length about the obstacles that women face and the global opportunities that could be unlocked if girls and women are treated fairly and equally alongside men. 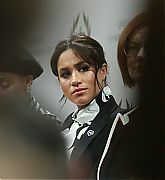 A video of the panel will be available soon. 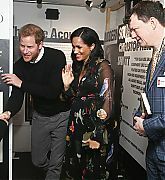 Meghan Markle and Prince Harry stepped out for a gala night for a new play that heralds a cause close to their hearts on Tuesday. 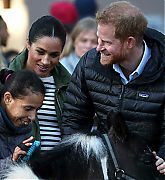 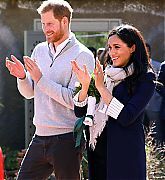 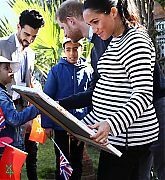 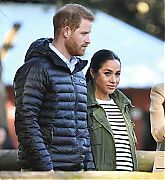 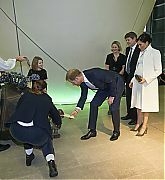 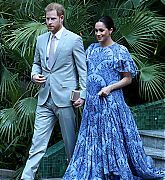 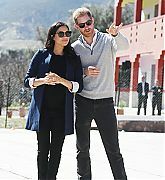 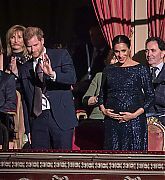 The royal couple, who are expecting their first child this spring, attended a special performance at the Natural History Museum in London of Wider Earth, a new theater production that supports their work on behalf of protecting forests around the world. 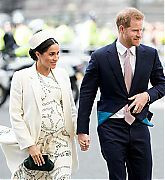 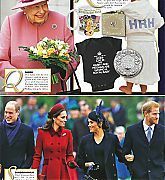 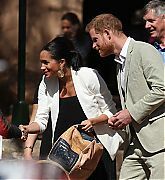 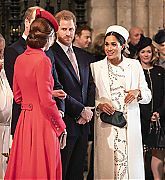 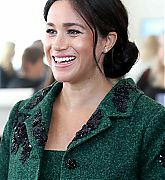 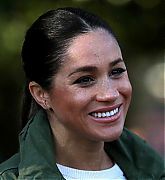 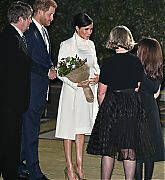 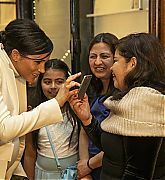 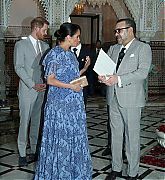 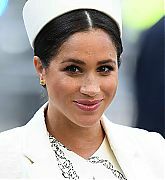 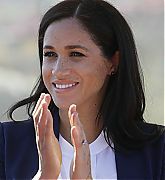 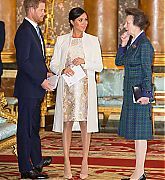 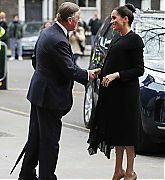 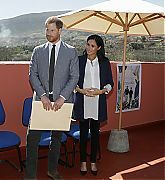 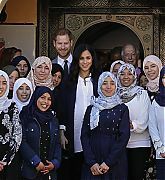 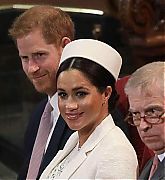 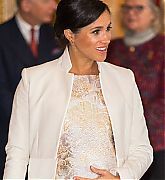 The Duchess of Sussex sported a monochrome look for the outing, pairing a cream-colored turtleneck dress by Calvin Klein with a coat by Amanda Wakeley, which she previously wore in March 2018 for a church service celebrating Commonwealth Day at Westminster Abbey. 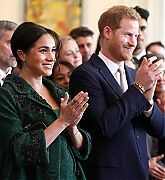 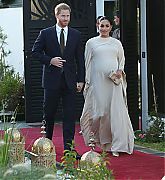 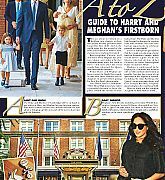 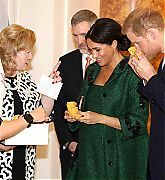 She carried the olive green clutch and green suede pumps she wore for Prince Louis’ christening last summer, and swept her hair into a romantic updo. 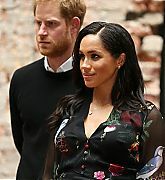 Inside the historic London landmark museum, the couple met donors and children and took a peek at some of the exhibits on show, including a preserved common octopus collected by Darwin in 1832, a first copy of On The Origin of Species, and a collection of wasps he made on The Beagle and other voyages. 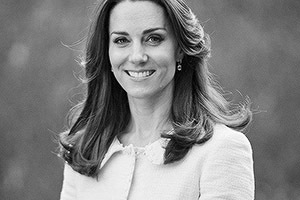 The production centers around Charles Darwin’s journey aboard the HMS Beagle. 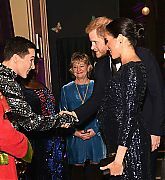 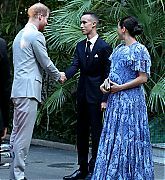 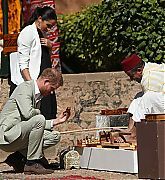 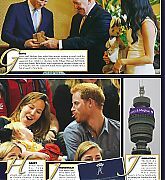 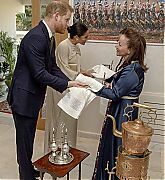 The event was in support of the Queen’s Commonwealth Trust, of which Harry, 34, is president, and the production’s official charitable partner, The Queen’s Commonwealth Canopy (QCC) — a network of conservation initiatives to conserve indigenous forests across the globe. 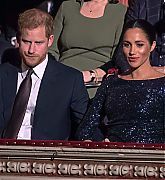 Harry, Duke of Sussex and Meghan, Duchess of Sussex attended The Endeavour Fund Awards at Draper’s Hall in London, England. 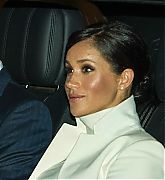 Meghan fist attended the awards last year while engaged to Harry. 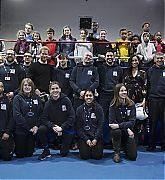 The awards recognize the significant achievement of nine members of the Armed Forces Community who were injured or fell ill in service, but have gone on to use sport and adventurous challenge as part of their recovery and rehabilitation. 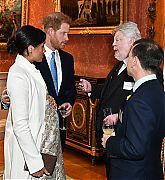 The Endeavour Fund, led by The Duke of Sussex and The Royal Foundation, provides financial backing and guidance to programmes and charities across the UK that support thousands of service personnel and veterans reach their full potential. 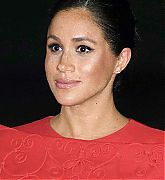 There are three nominees for each award that have been chosen from a long list of applicants. 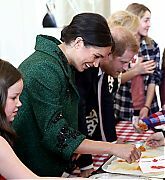 The Duke and Duchess of Sussex chaired the judging panel which has decided the final winners, who were announced at the Endeavour Fund Awards ceremony. 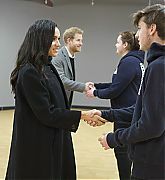 Meghan will join a workshop with members of the Pericles company, the National Theatre’s first Public Acts production in 2018 which brought over 200 people together with six professional actors to breathe new life into the Shakespeare classic in a musical version. 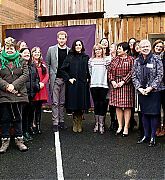 She will then meet current and former apprentices who are working as technicians in various departments including carpentry, metal work and painting. 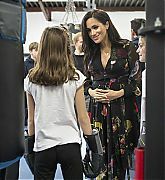 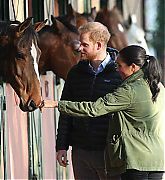 Continue reading Inside Meghan Markle’s Busy Week Ahead — Including a Day Away with Harry! 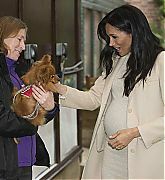 In her first engagement of the day and her first visit as Patron, The Duchess of Sussex visited Mayhew. 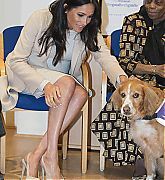 The Mayhew is an animal welfare charity working to improve the lives of dogs, cats and people in communities both in London and internationally. 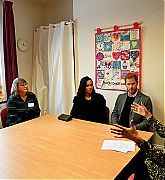 Meghan met with volunteers and residents who have used some of the Mayhew’s services including The TheraPaws Program which uses volunteers and their therapy dogs to go into care and residential homes, hospitals, hospices and day centres across London to engage with residents, provide companionship and brighten up their day and the Mayhew’s Pet Refuge, which provides shelter and care for the pets of people in crisis for short periods of time, like being hospitalised. 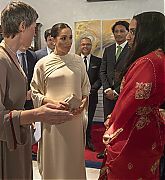 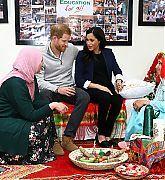 The Duchess chatted with Afghanistan Country Director, Dr Mo, to learn more about the Mayhew’s work abroad and Head Vet Nurse, Gillian Rich RVN, who spoke about the veterinary work they do on-site at the Community Vet Clinic. 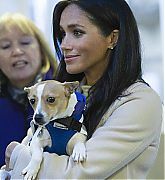 Ever the animal lover Meghan was smitten with several of the dogs who either have been adopted from the shelter or looking for their forever homes. 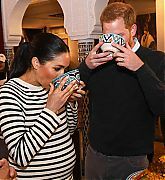 We’re sure they won’t be looking for long now!